God is in charge and has a plan. Regardless of the outcome of the election, I know a gracious and merciful God is in charge. I believe there is a greater plan. With that assurance, I can choose not to be anxious and afraid. The election is over. During the campaign, although I had a strong opinion about who I believed the better candidate was, I increasingly chose to keep my thoughts to myself. I found social media to be a toxic environment, and even personal conversations could become confrontational, even threatening. The most disturbing aspect of this election, for me, was the rupture of relationships. I read with horror vicious personal attacks launched on social media based solely on differing political views. The tone of discourse was upsetting. It seemed difficult, if not impossible, for people to “agree to disagree” on the candidates. This election depressed and exhausted me, stressed me out, and I’m relieved that it is finally over. The candidates’ closing speeches. I am grateful for the conciliatory tone Trump struck in his victory speech, and I hope that his supporters follow his lead. I listened to Hillary’s concession speech, and I was astounded at her grace, strength and composure in the face of such crushing disappointment. Her charge to young women to carry on the fight was an inspirational model of determination and fortitude. I believe that, even though she fell short in her bid to become the first female President of the United States, Hillary Clinton’s legacy will include the significant advancement of women in this country. A peaceful transition. The election has been likened to a “movement” or a “revolt.” Whether or not I agree with the direction, the electorate spoke through an orderly balloting process, and I am thankful that we live in a country where such extreme directional changes can occur without bloodshed. I am also thankful that the portion of the electorate that feels deep concerns about the outcome has the constitutional right to peaceful protest. I was almost more anxious about the immediate aftermath of the election than the election itself. It is also remarkable that we have a nation where bitter political rivals Trump and Obama have already met to discuss the transition of power amicably. My prayer is that our democratic process continues to be a beacon to the rest of the world. Group therapy. I believe this election presents an opportunity for healing in our country. Like a dysfunctional family, I’ve been reflecting on how poorly we’ve treated one another, how misunderstood we all seem to feel. I pray that all sides can learn to listen to the concerns of the other, to find common ground and not turn every issue into a zero sum game. My personal challenge is to better listen to and understand those I don’t agree with. In today’s sermon, our pastor preached on Luke 21:13, which is an admonition for Christians to, in the midst of suffering and persecution, look at these circumstances as “an opportunity to testify.” In other words, to tell my personal story, not a point-by-point argument for my opinions and beliefs. Likewise, I should be curious and open to hear others’ stories, particularly those with whom I have the most differences. It is at that level of personal dialogue that bridges can be rebuilt. But it may also be partly due to (my perceived) current shortage of inspirational national leadership. I am usually a political junkie, especially during presidential election years, but I can barely bring myself to follow this election. The news terrifies and depresses me. Instead, following coverage of Keenan Reynolds, who to me represents the good in our country and an example of a healthy role model, has been a welcome distraction. And it is frankly deeply comforting when, sometimes, good things happen to the good guys. Keenan was given his first start at quarterback as a freshman (highly unusual at Navy), took full advantage of the opportunity, worked his tail off, and never looked back. I probably read or saw every interview featuring Keenan (as previously mentioned, I’m obsessed). As he became more and more successful on the field, I half expected a cockiness or arrogance to emerge. Instead, I watched, incredulously, as he developed steadily and surely from a somewhat reticent teenager (suddenly thrust into the spotlight of leadership) to a humble yet confident, engaging and endlessly impressive young man. I recently read an interview with Scott Strasemeier (Sports Information Director for Navy), who marveled that Keenan, in his four remarkable years at Navy, has been under intense scrutiny and given countless interviews to the press, and that he has never once made a mistake. Not one flubbed speech or misstatement or missed opportunity to give credit to others. In fact, it was Keenan’s consistent insistence on deflecting praise from himself to his teammates and coaches, to putting the team’s success first, that initially made me such a fan. I am impressed with how Keenan has handled adversity. He has openly shared that playing in the NFL has always been a dream of his. However, he recognized and accepted that the five-year military commitment required of Navy midshipmen would be a significant hurdle to overcome (although recently there have been allowances made for exceptional athletes to facilitate their professional athletic careers). He stated emphatically that he would be honored to serve his country, pursuant to his own personal commitment, in whatever capacity he was needed, even if that meant never playing football again. I learned this year that there is something called the NFL Scouting Combine, which is apparently a big try-out for college players. Keenan was not invited. He was invited to the East-West Shrine Game in January (another great opportunity to shine for the pro scouts), but as a running back not a quarterback. Despite all his records and success as Navy quarterback, he was deemed too small with too little arm strength for the pros. He later recounted that his father called him, somewhat angry that Keenan was not given a chance at quarterback, but Keenan was grateful for the opportunity to play, in any position. He reportedly wowed the scouts in practice but had to skip the game because of a back strain. Accepting that the only chance he would have in the pros would be in a position other than quarterback (the position he played his entire life), Keenan worked out as a wide receiver with the Tennessee Titans and the New England Patriots and attended a pro day with the Baltimore Ravens, and began working with a punt receiver coach. All the while meeting his academic and military obligations at Navy, and consistently deflecting questions about his future and restating his commitment to the needs of the Navy. What most impresses me about Keenan, and what I believe is the bedrock of his leadership, is that he lives by a durable set of personal core values. His upbringing with strong, supportive parents, extended family and a faith community has provided him a solid internal and external support system. A good leader should have exemplary character and must be trustworthy. A good leader “walks the talk” and in doing so earns the right to have responsibility for others. Keenan, as a “plebe” (freshman) quarterback, was put in a position of leadership on the field over others who mostly outranked him off the field. He had the strength of character to lead, not from ego, but through loyalty to his teammates, poise under pressure, an exceptional work ethic, and a selfless drive to make the team and his teammates better. He earned the respect of his teammates. 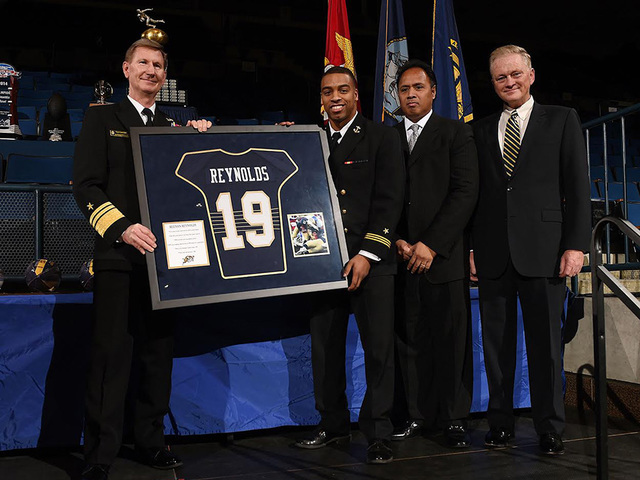 On February 28, 2016, the Naval Academy announced that Keenan Reynolds would be the last player to wear No. 19. Besides Keenan, only Roger Staubach, Joe Bellino, and Napolean McCallum have had their numbers retired by the school. Past recipients have included Tim Tebow, Michael Phelps and Peyton Manning. Keenan attended the ceremony with his mother and his speech (which of course made me cry) was a model of humility and grace, giving credit to his family, his faith, and his teammates for his success. 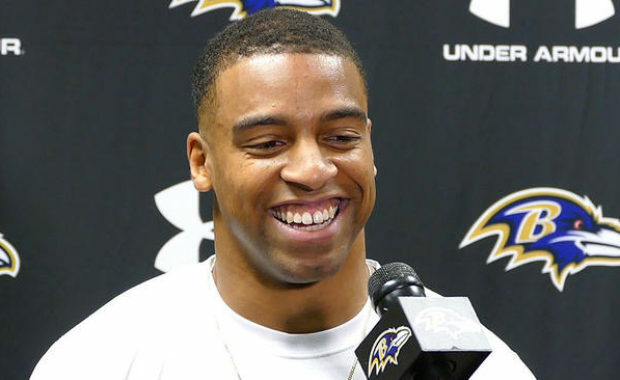 On Saturday, May 30 (I watched the NFL Draft live on my iPhone, something I have never done and never thought I would) in the 6th round, with the 182nd pick overall, the Baltimore Ravens selected Keenan Reynolds, as a wide receiver. I cried tears of joy as I watched the video feed of Keenan taking the call from the Ravens flanked by his mom, dad, little brother, and teammates. The Secretary of the Navy has recently recommended that Keenan be allowed to play full-time with the Ravens, and that he fulfill his military commitment through the Reserves. The Secretary of the Defense must still approve this recommendation, but by all accounts, it is considered a formality. I admit I am somewhat torn (as are many in the military community) as to whether Keenan should be allowed to play pro football full-time and immediately, without any active duty service commitment. Part of me would rather have someone of Keenan’s caliber protecting our country (his service selection was cyber-security) as opposed to knocking heads on Sunday. (And what if he gets a concussion? my psycho-mom-self worries.) However, it has been a joy, and an opportune diversion to watch the development and emergence of this fine young man. 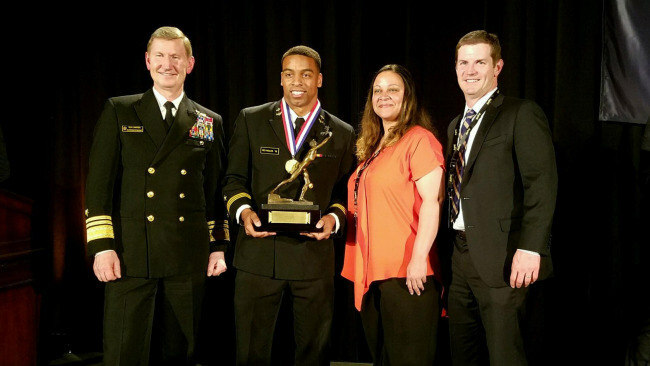 Wherever he lands, either in the sports world, the military, government, or business, he will be a beacon of light, and it soothes my spirit to know that we are producing the next generation of quality young leaders like Keenan Reynolds. And you bet I’ll be rooting for him on Sundays!